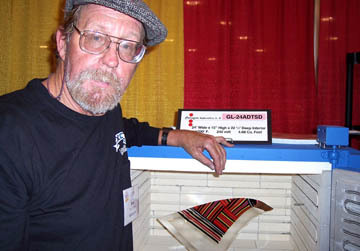 Dan Fenton has been described as a “walking-talking encyclopedia” for art glass techniques. A pioneer in the field, he established his own stained glass studio in 1969 in the East Bay. Dan combined slumping, fusing, cutting and reassembling, and painting to come up with unique designs and color compositions in a non-traditional style. Dan taught classes and workshops worldwide, and wrote many articles and books. He went through his many years worth of his notes, and combined the best into these collections. In Dan’s own words, “You will have at your fingertips the wealth of technical knowledge that can only come from years of experimentation and experience.” Dan was a generous innovative spirit and will be greatly missed. Over 20 years of Dan’s notes on kiln working, including slumping, fusing, firing and annealing, paints, lusters, Pate de Verre, casting, and sources. Sandblasting on Glass, Dan Fenton and Kathy Bradford. Over 8 years worth of Dan’s notes on sandblasting, including resists, shading, carving, and equipment. Kiln Work Problem Solving Over 10 years of Dan’s notes on kiln work problem solving, including fusing, firing, annealing, and sources. Dan was a long time friend. We didn’t see each other much any more. The glass world will miss him, I am sad he is not with us. I’m so sad to hear about Dan’s passing. I attended many of the workshop’s he offered in the late 70’s & early 80’s. He was ALWAYS generous with his knowledge and information. Rest in peace.